You will be given a Free reference e-book to read which has 505 pages And the test will be based on that e-book. CCSP SECUR is one of the certification exams required to be taken by all aspiring Cisco certified security professionals. SECUR actually stands for Securing Cisco IOS Networks (SECUR) and its related certification exam is said to cover an extremely broad range of topics related to networking security. It should be noted that in order for you to pass this exam, you need to obtain a clearer overview about the most crucial components linked to securing networks. You will also be required to enhance your knowledge on the most popular security policies, AAA which stands for Authentication, Authorization and Accounting, evaluation of security threats, firewall features designed for IOS, PIX firewall configuration, basics of integrating VPN solutions and Cisco Secure policy manager and the most advanced and effective encryption technologies. If you have a higher level of familiarity regarding these terms, concepts and technologies, then your chances of easily taking up the certification exam and become one of the most effective, skillful and knowledgeable certified experts will become greatly possible. The good thing about desiring to become a CCSP SECUR certification exam passer is that you have greater chances of achieving this because Brainmeasures now offers a free CCSP SECUR practice course. This free practice course features a free study guide which is a key towards fully understanding the major topics covered in the certification exam and a free practice test which can guide you all throughout the process of preparing for the examination. The free CCSP SECUR certification practice course which you can now easily access at Brainmeasures is your key towards generating a better understanding about becoming a CCSP SECUR certification holder. 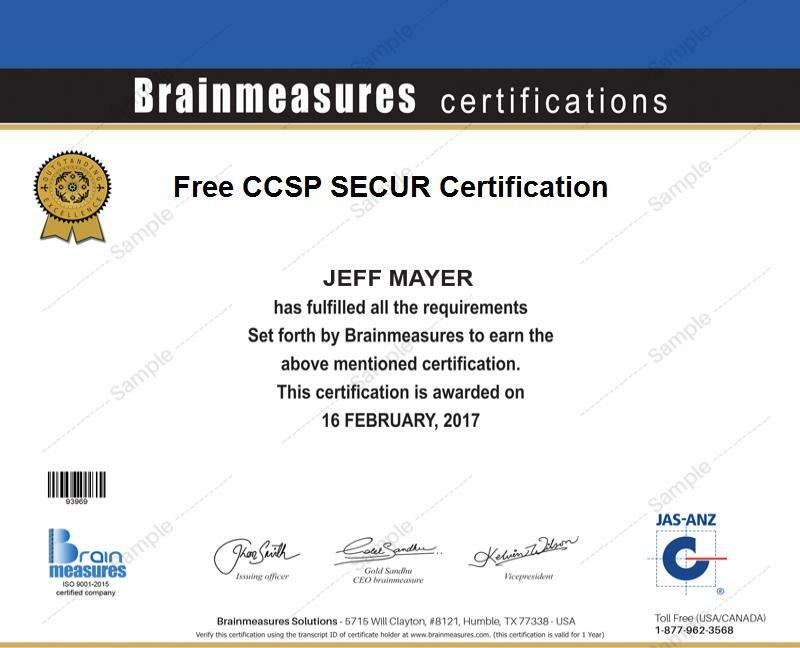 Brainmeasures has already gained worldwide recognition as a legitimate and highly reliable online certification programs and courses provider and this serves as a strong indication that its CCSP SECUR practice course is also professionally established and created in such a way that you can easily grasp even the most complex aspects and concepts related to the field. What you will enjoy about this free practice course is its highly extensive and easily understandable free study guide which talks about all aspects related to securing networks in the most simplified yet comprehensive manner possible. This gives you an easier time absorbing blocks of information that are extremely useful in becoming certified. Brainmeasures also takes pride of the free practice test included in the practice course considering its effectiveness in shaping you into a confident and successful taker of the certification exam. How to defend your network against attack threats? The free CCSP SECUR certification practice course which is now offered by Brainmeasures aims to help a variety of individuals and professionals who plan to pursue a career as a certified Cisco security professional and prepare themselves for the SECUR exam which is known as one of the major components of the CCSP exam. The study materials that are included in this practice course can also appeal to a variety of networking professionals who are seriously planning to obtain a more complete understanding about network security techniques, policies and strategies. Generating a higher level of salary is also a great possibility after you successfully passed the actual CCSP SECUR certification exam. With your certificate, it would be easier for you to work as a network security technician which entitles you to enjoy approximately $49.000 to $91,000 yearly. If you work as a network security manager, then you can start earning within the profitable range of $79,000 to $152,000 annually.